Rusted bolt.Photo by <a href="http://commons.wikimedia.org/wiki/File:Rust_Bolt.JPG">Thester11, via Wikimedia Commons</a>. Stainless steel has two nominal positions on the electrochemical series. In the absence of [oxygen] the alloy becomes highly active and thus subject to very high rates of corrosion, including fatigue corrosion. Heated water, particularly boiling water, [off]gasses latent [oxygen] almost immediately, thus stainless steels in such an environment rapidly corrode due to both becoming active and being at an elevated temperature. Sounds like a nasty brew in a boiling-water reactor. More alarmingly, this reader told me that a hot reactor doused with seawater would likely drive flanged bolts—particularly stainless-steel bolts—to failure in as little as months, and that steam plants are pegged together with thousands of flanged volts. Meanwhile, authorities in Japan are finally voicing the reality that the situation at Fukushima is going to need babysitting for years. Example of a spent fuel pool. Credit: DOE via Wikimedia Commons. In this week’s issue of Science, Eli Kintisch takes a chilling look at the realities of reactor #4 at the Fukushima plant—especially in light of the fact that the reactor was offline at the time of the quake. Its spent fuel rods were still cooking though in their spent-fuel pool. The pool held the entire complement of fuel rods from the reactor’s core, which had been emptied 3 months before the 11 March earthquake and tsunami struck. And yet on 15 March the building exploded, apparently fueled by hydrogen, leaving nuclear engineers to speculate about the source. Adding to the confusion are reports of fires in the pool, a worst-case scenario that had never before occurred in a working nuclear plant. The problem at #4 might be related to the zirconium alloy tubes holding the spent fuel rods. Lab experiments have shown that zirconium can burn either with steam or with oxygen. Both reactions progress rapidly at roughly 800°C [1,472°F]; the former, crucially, releases hydrogen. The hydrogen explosion at reactor #4 points to the steam reaction, which releases less energy and therefore melts the fuel more slowly. 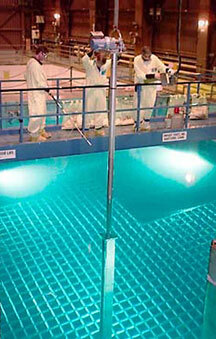 But knowing which reaction dominated could help scientists quantify how much radioactivity was released from pool #4. A 2006 study by the U.S. National Research Council said that a heat up after a loss-of-water event could melt the spent fuel, allowing the escape of volatile radionuclides, including “a substantial fraction of the cesium,” into the air. 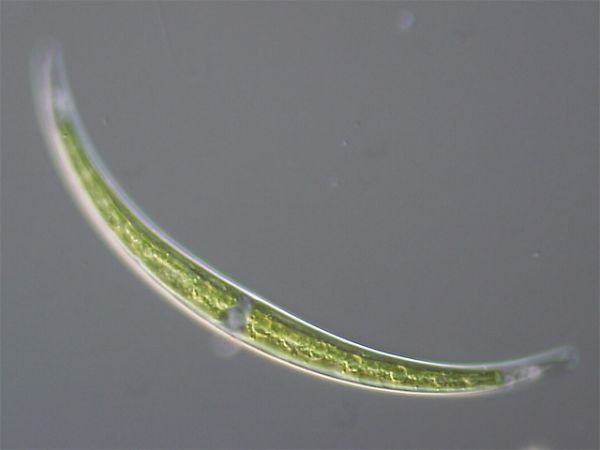 An alga from the genus Closterium. Credit: ja:User:NEON / User:NEON_ja, via Wikimedia Commons. Richard A. Lovett at Nature reports on a presentation yesterday at a meeting of the American Chemical Society on the power of a humble alga, Closterium moniliferum, to remove the element strontium from water and then deposit it in crystals inside its own cells. Minna Krejci, a materials scientist at Northwestern University, believes Closterium might have a talent for cleaning up the radioactive isotope strontium-90—a dangerously carcinogenic isotope that infiltrates milk, bones, bone marrow, blood, and other tissues. The algae don’t actually target strontium. Instead, they incidentally collect strontium as they go about the business of gathering barium. But that could work in our favor cleaning up radioactive water. Krejci’s research has found that it is possible to enhance the uptake of strontium by tailoring the amount of barium in the algae’s environment. This, she says, means that it might prove possible to seed nuclear waste, or a spill of radioactive material, with barium to encourage the algae to grab the strontium—easy to do, she says, because “it would only be a small amount” of barium. It might also be possible to improve the process by tinkering with sulphate levels in the environment, thereby changing the amount of sulphate in the vacuoles. “Once we learn about how the cells respond to conditions, we can think of more elegant ways to manipulate them,” says Krejci. Once isolated by the bacteria, the strontium could be sequestered in high-level nuclear waste repositories, while the rest of the waste could go to a less expensive lower-level repository, saving space and money. Currently, Krejci says, there are hundreds of millions of litres of stored nuclear waste in the United States alone, much of which contains strontium. “So we know it’s a big problem,” she says.